The four artists in the upcoming Artists of Hawai‘i 2017—Kaili Chun, Kasey Lindley, Kaori Ukaji, and Hongtao Zhou—have been at work on their projects since last February. As the longest-running, all-media juried exhibition in the state, Artists of Hawai‘i has been an island staple since 1950. Almost a decade ago, the museum thought it was time to start reassessing the exhibition to better serve artists. Since 2009, when the museum made the annual exhibition a biennial event, Artists of Hawai‘i has been steadily evolving. In 2011, the show featured 118 works by 79 artists. The museum’s curatorial team wanted the exhibition to offer artists a deeper experience than having a work in a show for a couple of months, but with so many artists, it wasn’t possible to work with each one. So for the 2013 exhibition, in 2012 the museum asked artists to submit images of 10 to 12 works that provided an in-depth look at their work. From 341 entrants, the curatorial team selected 11 artists to create new work for the exhibition over 10 months, with curator of contemporary art James Jensen visiting their studios to discuss their projects and monitor progress. The result was a focused show for the first time, which leaned toward painting. In 2015, the selection was refined down to eight artists, with installations—ranging from .5ppi’s psychedelic video installation to Jesse Houlding’s “drawings” made of magnetized iron shavings. Again, Jensen went on studio visits guiding the artists through the process. It was an exciting advance, pushing artists out of their comfort zones and exposing visitors to new kinds of work by artists they normally wouldn’t have access to. For next year’s exhibition, opening Feb. 9, the museum has pushed the envelope further, selecting—and inviting—artists to fit a theme of work based on spatial experience that has a participatory element. Read our press release for more on the changes and selection criteria for Artists of Hawai‘i 2017. In August, the HoMA blog tagged along with Healoha Johnston, curator of the exhibition as well as of the museum’s arts of Hawai‘i collection, on a studio visit. 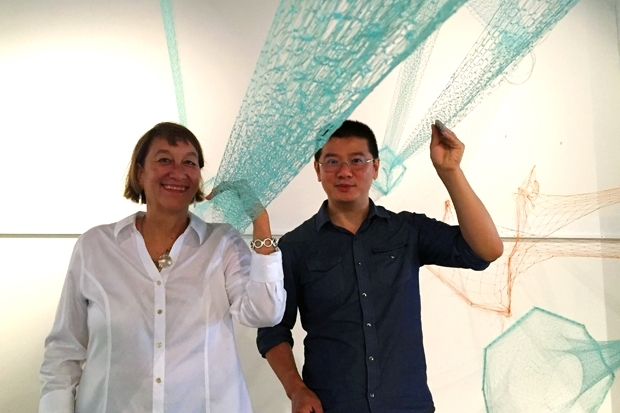 The destination: The University of Hawai‘i Architecture School, where the collaborative team of Kaili Chun and Hungtao Zhou—both artists and architects—had a temporary studio where they were experimenting with their Artists of Hawai‘i installation, titled Net_work. Zhou is an assistant professor of architecture and director of the Architecture School Gallery at the University of Hawai‘i. In between exhibitions, he coopted the gallery as an interim studio space for his and Chun’s work. Inside was a work table covered with maquettes, tools, and reference books, and behind it, aqua and orange fishing nets stretching across the room at different angles, like the laser beams challenging a lithe Catherine Zeta Jones in the 1999 film Entrapment. And that is exactly what the collaborators hope visitors to Artists of Hawai‘i will experience (they urge you to wear pants). Architect-artist Hongtao Zhou (left) and artist-architect Kaili Chun (right) discuss their Artists of Hawai‘i project with HoMA curator of the Arts of Hawai‘i Healoha Johnston (center). Through brainstorming and lots of sketches, Chun and Zhou found their way to this concept. Early on, recalled Johnston, the artists considered working with bamboo and steel cables. “We had been exploring a lot of materials and probably did more than 30 different drawings, but I think the net idea first came up when we were with Healoha in our first meeting at the museum,” said Zhou. “In the beginning, we started with this sort of ocean situation for fish and other creatures—with fish, nets and the great Pacific garbage patch. The idea of ‘net’ is really interesting,” said Zhou. Once they settled on nets as their primary material, Zhou took note that in their discussions Chun used the word “stretching” repeatedly. “She was saying we don’t have to make the shape of the net, we can stretch it, so that word came up three or four times. We thought that was interesting, so then we started stretching it across space,” said Zhou. As the artists and curator discussed the work, they revealed different layers of meaning in the different layers of net. “The orange net and green net are made of different materials, and are used to catch different things. 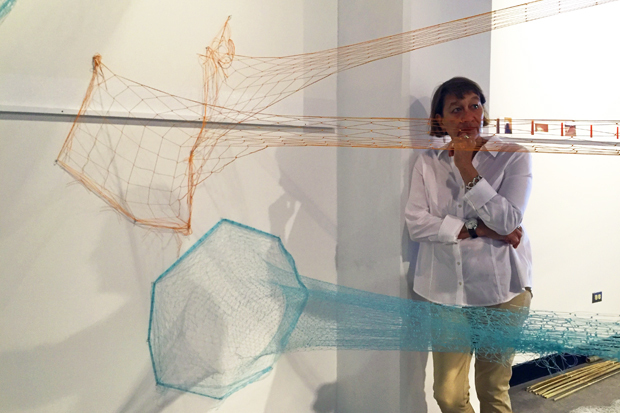 The orange net is used to catch lobsters, while the blue is standard monofilament, so the piece itself introduces these different industries and economies,” says Johnston. Johnston, taking the artists’ backgrounds into account, reached out to Chun and Zhou to suggest they work together for Artists of Hawai‘i. Her instinct turned out to be a home run. The two fruitfully feed off of each other, while bouncing ideas off Johnston. 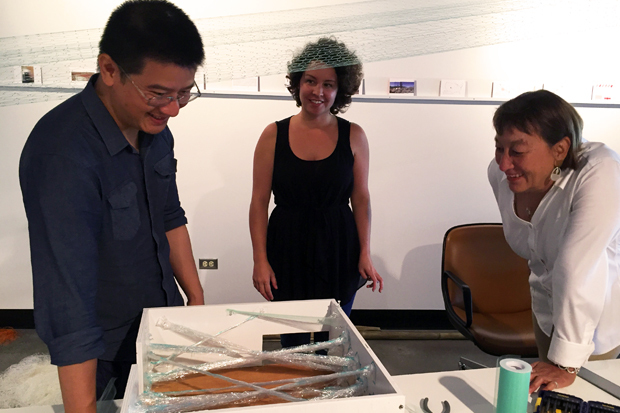 We can’t wait to see how Net_work turns out when Artists of Hawai‘i opens in six weeks. Artists of Hawaii? Where are the local Hawaiian artists?